Based on the true story of an elephant’s journey, this is a delightful book set in Victorian England. Maharajah the elephant walked from Edinburgh to Manchester and became a local celebrity. Kerr has mixed fact with fiction to create a gripping work full of adventure. The fictional rider, Danny, is a young boy who is mute due to a trauma which is gradually revealed. When he accidentally bids for Maharajah at an Edinburgh auction his zookeeper employer comes up with an idea for him to redeem himself. He’ll transform Danny into a bejewelled Indian prince and set him on a journey with the elephant to garner publicity. Maharajah creates a great stir and even Queen Victoria herself follows his adventures. But there are shady people with a vested interest in making sure that the journey is a failure. The relationship between the elephant and his young rider forms the heart of the book. There’s plenty of conflict, an interesting parade of villains and heroes and enough mystery and adventure to keep you happily reading along until the very end. 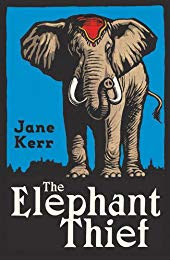 Kerr’s writing style is engaging and her portrayal of the relationship between the boy and the elephant is believable and charming. The strikingly simple cover is a great asset too. This is Kerr’s debut novel and is published by Chicken House. ‘The Elephant Thief’ is written for YA but is also a great read for adults.